Photomedicine includes both the study and treatment of diseases caused by exposure to light and on the other hand the diagnostic and therapeutic applications of light for detecting and curing disease. Light is composed of packets of energy called photons (as described in the Introductory Photophysics module). For the purposes of this section, light is defined as non-ionizing electromagnetic radiation between the wavelengths of 200 nm to about 10000 nm. Light energy is capable of causing heating, mechanical effects and chemical reactions. The transfer of light energy through photon absorption can lead to many different consequences in photomedicine. Moreover, there are many new approaches for using light to see inside the body to detect and diagnose disease. * Why do identical photons produce harmful medical effects in some instances (such as skin cancer), but helpful effects in others (such as vitamin D production)? * Is there any way to control the effects of the light energy in photomedicine? * What light sources are beneficial in photomedicine? * What can we do to maximize the beneficial effects, while minimizing the deleterious effects? Humans have evolved in an environment where they spend roughly half their lives exposed to light from the sun. The precise characteristics (wavelength distribution and intensity) of sunlight depend on which latitude on the earth they inhabit, what the time of day is, and the season of the year. Sunlight is more intense the nearer to the equator, nearer to midday, and the nearer to midsummer. In addition, the dominant wavelengths in sunlight are shorter at midday, and longer in morning and evening. This is because the distance through the atmosphere, which the sunlight must travel to reach the observer, is longer at morning and evening, because the sun is lower in sky. Passing through the atmosphere selectively absorbs ultraviolet and blue wavelengths, leaving the red. Because ultraviolet (UV) light is damaging to the skin, people who live nearer to the equator tend to have darker skins with more of the protective pigment called melanin. Part of the problem of skin diseases caused by chronic sun exposure has arisen because fair skinned people have migrated to countries nearer the equator, and another cause of diseases produced by light is due to the fashion for sunbathing. 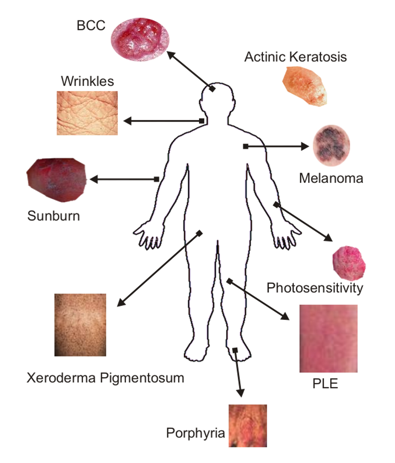 Figure 1 shows a variety of skin diseases caused or exacerbated by sun exposure. Figure 1. Cutaneous diseases caused by light. BCC, basal cell carcinoma; PLE, polymorphic light eruption. The two dominant diseases caused by chronic sun exposure are photoaging (leathery wrinkled skin), and the induction of skin cancer (both the dangerous malignant melanoma and the less dangerous non-melanoma skin cancer). Harmful acute effects of sun exposure include sunburn and various photodermatoses. The interaction of UV light with the skin causes a complicated cascade of events that involve cellular damage and repair, pigmentation changes, vascular and immune suppression effects. It is still unclear what are the health risks in terms of increased rates of infection and cancer that stem from the UV-induced suppression of the immune response. Research is ongoing to determine the molecular nature of the cellular events and pathways that lead to UV-induced sunburn, melanoma and non-melanoma skin cancer, and immune suppression (Ichihashi et al., 2003). UVB wavelengths are absorbed by the nucleic acid bases that tend to have peaks at 260 nm but these peaks are broad and extend into the biologically relevant 300-340 nm region received by skin. The chemical reaction caused by the UV absorption results in the formation of several types of DNA lesions, including thymine-thymine dimers (Figure 2). Figure 2. 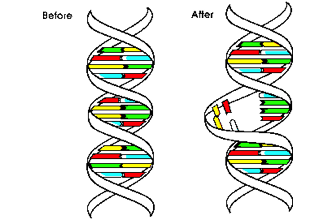 Schematic depiction of UV-induced DNA lesion formation (T-T dimers). The adjacent yellow thymine residues become linked together, and the formation of the dimer distorts the DNA, and this distortion is detected by the DNA repair enzymes. Without protection from the sun's rays, just a few minutes of exposure each day over the years can cause noticeable changes to the skin. Freckles, age spots, spider veins on the face, rough and leathery skin, fine wrinkles that disappear when stretched, loose skin, a blotchy complexion, actinic keratoses (thick wart-like, rough, reddish patches of skin), and skin cancer can all be traced to sun exposure. "Photoaging" is the term dermatologists use to describe this type of aging caused by exposure to the sun's rays. The amount of photoaging that develops depends on: 1) a person's skin color, and 2) their history of long-term or intense sun exposure. People with fair skin who have a history of sun exposure develop more signs of photoaging than those with dark skin. In the darkest skin, the signs of photoaging are usually limited to fine wrinkles, and a mottled complexion. Photoaging occurs over a period of years. With repeated exposure to the sun, the skin loses the ability to repair itself, and the damage accumulates. Scientific studies have shown that repeated UV exposure breaks down collagen and impairs the synthesis of new collagen (Scharffetter-Kochanek et al., 1997). The sun also attacks our elastin. Sun-weakened skin ceases to spring back much earlier than skin protected from UV rays. Skin also becomes loose, wrinkled, and leathery much earlier with unprotected exposure to sunlight. The deep wrinkles, age spots, and leathery skin indicate premature aging caused by years of unprotected exposure to the sun. People who live in sun-intense areas, such as Florida or Arizona, can show signs of photoaging in their twenties, and can develop actinic keratoses (AK) and skin cancer at a young age. Using sunscreens and limiting sun exposure are two approaches for mitigating the chronic adverse effects of sun exposure. There is a counterbalancing beneficial effect of UV light delivered to the skin during sun exposure. This is the increase in vitamin D biosynthesis due to the conversion of provitamin D3 (7-dehydrocholesterol) to previtamin D3 by the action of ultraviolet radiation on the skin (Holick et al., 1978). Previtamin D3 is then thermally converted to vitamin D3 in the skin, and the vitamin is then transported to the liver on the vitamin D-binding protein. It is thought that there might be an unrealized problem of chronic vitamin D deficiency amongst people who live in Northern climes, and this could lead to increased occurrence rates of some cancers. The existence of two opposing good and bad effects of sun exposure has led on occasion to heated debates among photobiologists and dermatologists. In addition, there exist a number of rarer diseases characterized by adverse effects (either acute, chronic or both) suffered by particular individuals exposed to doses of light that would have no effect on a normal person of similar skin color. Many of these diseases are caused by some genetic mutation or abnormality, whereas other are acquired at various stages of life. Examples of these diseases are xeroderma pigmentosum, in which the enzymes that repair DNA damage in the skin caused by UV light are not working properly, leading to early development of skin cancer; various porphyrias in which defects in heme biosynthesis lead to levels of photosensitizing porphyrins being present in the skin, and polymorphic light eruption (cause unknown) leading to rashes on receiving mild sun exposure. Secondary photosensitivity disorders involve photosensitizing drugs, such as some antibiotics and psychoactive compounds, photosensitizing ingredients in foods (such as lime, bergamot), and photoallergic reactions in which a person can become sensitized to an allergen that is then much worse after sun exposure (Scheuer et al., 2006). St Johns Wort (a popular herbal supplement used for depression that contains the photosensitizer hypericin) has been responsible for many of these cases of photosensitivity (Kubin et al., 2005). * Absorbers of UV radiation: chemical sunscreen ingredients such as para-amino benzoic acid (PABA), cinnamates, salicylates and benzophenones (Dunford et al., 1997). * Reflectors of UV radiation: physical sunscreen ingredients such as titanium or zinc oxide. A third class of topical agents is the antioxidants, such as vitamins E and C, which do not absorb or reflect UV radiation, but are believed to enhance the ability of skin cells to repair damage induced by UV radiation. Sunscreens usually consist of a combination of several photoprotective chemicals. The degree of protection they provide is measured as a sun protective factor (SPF). Persons who always burn rather than tan; typically a person with pale white skin, red or blond hair, and blue or green eyes-are at highest risk for photoaging and skin cancer and should always use maximum photoprotection. Dermatologists strongly recommend a broad-spectrum sunscreen with SPF of 15 or higher for all skin types. SPF is determined in the United States by a guideline accepted by sunscreen manufacturers and the Food and Drug Administration (FDA). Topical sunscreens are marketed as lotions, creams, gels and ointments; the type you choose is a matter of personal choice (Kullavanijaya et al., 2005). An effective sunscreen should also be broad-spectrum, providing protection against both the A and B wavelengths of UV. Both UVA and UVB are present in sunlight, and both can cause skin damage (Kang et al., 1997). The UVB wavelengths are the principal cause of sunburn. UVA can penetrate to deeper layers of the skin. Since most chemical ingredients of sunscreens are most effective against either UVA or UVB, many sunscreens are a mixture of UVA and UVB-absorbing chemicals, or physical blocking agents such as zinc oxide. You can check the label to see if a sunscreen provides both UVA and UVB protection. A sunscreen providing only UVB protection is effective against sunburn, but less effective against the deeper penetrating UVA. You can also check the label of a sunscreen product to see if it contains ingredients that provide broad-spectrum (UVA-UVB) protection, e.g., oxybenzone, cinnamates (octylmethyl cinnamate and cinoxate), sulisobenzone, salicylates, titanium oxide, zinc oxide, and avobenzone (Gaspar et al., 2006). In one sense, all traditional (old-fashioned) diagnostic medicine involved light and optics. The doctor would examine his patient under a bright light or a colored light, or use a hand lens to improve upon what he could see unaided. Then came the advent of various imaging technologies such as X-ray, computed X-ray tomography, magnetic resonance imaging, positron-emission tomography, single photon emission computed tomography etc. Now things have come full circle with researchers developing optical imaging technologies relying on visible and near-infrared (NIR) light. Visible light penetrates into biological tissues more than one might think. Red and NIR light penetrates deeper than green, blue or violet light. You can visualize this phenomenon by shining a white flashlight through your hand, observing a red glow on the other side (the blue and green wavelengths having been absorbed). Red light penetrates more because it is not strongly absorbed by blood and because it tends to scatter more. Therefore, red or NIR light is generally used to "see" deeper into the body. Optical imaging techniques could be cheaper, less invasive and less toxic, because light is non-ionizing compared with the previous techniques mentioned above. Of course, tissue is far from transparent to visible and NIR wavelengths when compared to much shorter wavelengths (X-rays), or to much longer wavelengths (radiowaves). Therefore extraordinary measures must be taken to derive useful diagnostic imaging information from these wavelengths of light (Grier, 2003). Information may be acquired from photons that are scattered, from photons that are absorbed, and from photons that are re-emitted after being absorbed in tissue, as illustrated in Figure 3. Examples of the first class of techniques are optical coherence tomography (Brezinski, 2006) in vivo confocal microscopy (Selkin et al., 2001), and light scattering spectroscopy (Perelman, 2006). Examples of the second class are the pulse oximeter for measuring blood oxygenation (Trivedi et al., 1997), diffuse optical tomography (van de Ven et al., 2009) and photoacoustic imaging and spectroscopy (Wang, 2009). Examples of the third class include autofluorescence imaging (Schmitz-Valckenberg et al., 2008), in vivo confocal fluorescence microscopy (Goldman et al., 2005), and Raman spectroscopy (Smith et al., 2005). Figure 3. 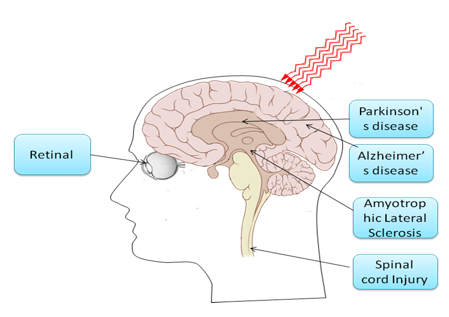 Schematic diagram of how scattered, absorbed, or re-emitted photons can be used to obtain diagnostic information in living tissue. Optical imaging is capable of producing information on the spatial location of lesions with varying degrees of resolution and by employing spectral analysis information can be obtained on the identity and relative concentration of tissue molecular constituents. One goal of optical imaging is the "optical biopsy". Because in principle optical imaging has the potential to provide the same sub-micron resolution that is taken for granted in optical microscopy, some investigators have tried to replicate diagnosis using non-invasive optical biopsies. This is more valuable when one considers that in conditions like Barrett's esophagus scores of random excisional biopsies may be taken, and in other anatomical locations such the coronary arteries taking any biopsies is impossible. In practice since tissue is highly opaque the light is often delivered into the body and diagnostic information is retrieved via fiber optic catheters that can inserted into hollow organs via endoscopes and even threaded through blood vessels. Another active area of research in optical diagnostic imaging is the use of optical contrast agents. These are exogenous chemicals that can act as optical reporters by such means as high scattering, fluorescence, phosphorescence, photoacoustic properties, etc. 4.1. Cancer diagnosis. Optical diagnosis relies on the structural and biochemical differences between cancer tissue and normal tissue that can be probed with visible or NIR light. Cancerous cells are more active and reproduce at an abnormally high rate. They also tend to have larger and more numerous nuclei. On the tissue level, tumors have immature collagen as well as a pronounced network of immature blood vessels due to angiogenesis, and therefore a higher blood content. Exogenous substances that accumulate in tumor tissue can enhance the optical contrast between tumors and normal surrounding tissue. Fluorescent dyes have been developed that can be used to delineate tumor borders or detect otherwise invisible lesions. These fluorescent dyes are frequently chemically attached to some targeting vehicle that recognizes specific molecules or markers expressed or over-expressed on tumors. Examples of these targeting vehicles are monoclonal antibodies, peptide sequences that bind to tumor cell receptors, vitamins such as folic acid, and certain sugars. Fluorescent dyes used for diagnosis should have low intrinsic toxicity, be resistant to photobleaching, and preferably both absorb and emit in the near-infrared spectrum. Novel types of optical contrast agents that have attracted attention include: quantum dots (Bentolila et al, 2009), gold nanoshells (Hu et al., 2008), oxygen sensitive phosphorescent dyes, etc. (O'Donovan et al., 2005). 4.2. 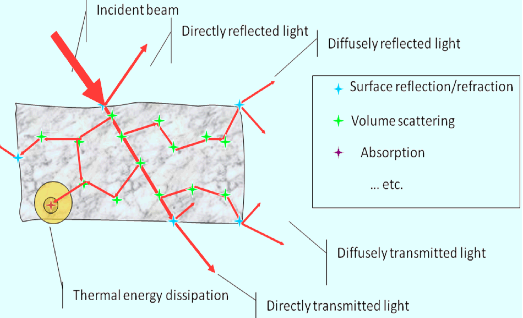 Determination of tissue optical properties for light dosimetry. Many diagnostic and therapeutic applications require knowledge of the light flux through tissue. Photons that enter tissue are scattered once or multiple times until they either escape or are absorbed (Figure 4). Computer simulations that track the movement of photons through biological tissues are based on the absorption and scattering properties of each specific tissue. Absorption and scattering coefficients and anisotropy factors (the direction in which photons are scattered in tissue) are determined through a combination of experimental measurements and optical theory (Benaron et al., 1997). Figure 4. Schematic of light propagation in tissue (courtesy of Anna N Yaroslavsky, Wellman Center for Photomedicine). One popular method used to calculate light propagation in tissue is known as the Monte-Carlo method because it relies on a very large series of random scattering events. An increasingly popular technique in optical diagnosis is to use 5-aminolevulinic acid (ALA) to carry out fluorescence detection. ALA is a metabolic precursor of the red fluorescent porphyrin, protoporphyrin IX (see Section 10). This means that lesions with high levels of metabolic activity such as cancers and other areas of inflammation can be easily visualized under blue light if ALA has been administer a few hours before by topical application or even by mouth. So far the most successful applications have been in detecting bladder cancer during cystoscopy (Witjes et al., 2007), delineating the infiltration of glioma into the normal brain during open-skull surgery for brain tumors (Kaneko, 2001), and in the bronchus or oral cavity (Leunig et al., 2000) for early dysplastic lesions. Phototherapy involves the transformation of light energy to chemical, kinetic or heat energy in order to achieve a desired physiological result. As stated by the First Law of Photobiology, light energy must be absorbed by an atom or molecule in order to initiate a physical or chemical process. Therefore, light that is used for therapeutic applications must be absorbed by a specific chromophore in the biological tissue. The chromophore may be endogenous (naturally occurring in cells or tissue), or exogenous (deliberately added to cells or tissue for a therapeutic purpose) as listed in Table 1. Table 1. 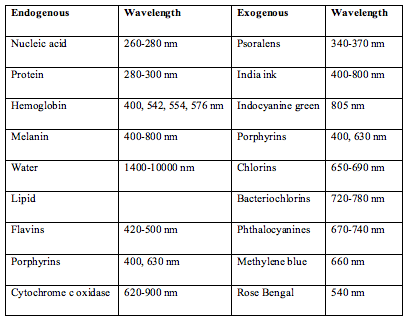 Endogenous (naturally occurring) and exogenous (added from outside) chromophores, and their main absorption wavelengths of importance in photomedicine. Light energy is deposited in tissue as the photons are absorbed in the tissue. The absorbed energy is largely converted to heat. The body's vascular system removes heat from the treated area over a period of time. However if the heat builds up quickly, such as a large optical power over a short illumination time, sections of the tissue may boil, vaporize, burn or even explode. On the other hand, the same total amount of light applied very slowly to allow heat dissipation by the vascular system leads primarily to photochemical reactions. Therefore, the rate of application of light is as important as the total amount of absorbed light (Vreman et al., 2004). Lasers can cause localized damage by selectively heating dark target matter (often blood or melanin) while not heating the rest of the skin or tissue. Light is absorbed by dark objects, so laser energy can be absorbed by dark material in the skin (but with much more speed and intensity). This dark target matter, or chromophore, can be naturally-occurring or artificially-introduced. 6.1. Dermatology. The medical specialty with the largest involvement of lasers is dermatology. The skin is readily available for light delivery, has many clearly visible markings upon it and has a high patient demand for aesthetic and cosmetic improvement. This has led to many laser companies developing equipment for dermatologic applications and the growth of cosmetic laser clinics. * Absorption of green light produced by argon (488 nm), KTP (532 nm) or dye lasers (570 nm) by hemoglobin is the basis for treatment of vascular lesions. These comprise port wine stains, hypervascular birthmarks, hemangioma, angiofibroma, pyogenic granuloma telangiectases and varicose veins. * Visible and near-infrared lasers are also used for the removal of pigmented lesions. These include lentigines, nevus of Ota, congenital melanocytic nevi cafe-au-lait macules, and nevus spilus (Tuner et al., 2004). Hair removal (photoepilation). Melanin is considered the primary chromophore for all hair removal lasers currently on the market. The very broad absorption spectrum of melanin means it absorbs all wavelengths in the visible and near-infrared. Melanin occurs naturally in the skin (it gives skin and hair its color). There are two types of melanin in hair: eumelanin (which gives hair brown or black color) and pheomelanin (which gives hair blonde or red color). Because of the higher absorption of photons of laser light by eumelanin, black or brown hair is much easier to remove than blond hair (Goldberg et al., 2000). Both men and women seek laser hair removal services to have superfluous or unwanted hair removed. Hair removal is commonly done on lip, chin, ear lobe, shoulders, back, underarm, abdomen, buttocks, pubic area, bikini lines, thighs, face, neck, chest, arms, legs, hands, and toes. Laser works best with dark coarse hair. Light skin and dark hair are an ideal combination, but new lasers are now able to target dark black hair even in patients with dark skin. Hair removal lasers have been in use since 1997, and the Food and Drug Administration approved it for "permanent hair reduction." Laser hair removal has become extremely popular because of its speed and efficacy, although some of the efficacy is dependent upon the skill and experience of the laser operator, and the choice and availability of different laser technology at the clinic that is performing the procedure. Some will need touch-up treatments, especially on large areas, after the initial set of 3-8 treatments. It has also been observed that some people seem to be non-responders; this is not confirmed and reasons are not known, and may in fact be due to the lack of skill on the part of many laser operators and/or the type of machine and settings they are using (Goldberg et al., 2000). Tattoo removal. Tattoo removal uses lasers that are "tuned" to the color of ink used in the tattoo. Pulsed laser is thought to fragment the tiny ink particles via photothermal expansion, and these tiny particles can be now be removed from the skin by macrophage cells, that engulf them, and then migrate to draining lymph nodes (Bernstein, 2006). The treatment needs to be repeated several times over a course of therapy, and many different lasers may be used if the tattoo contains different colors of ink (Figure 5). Figure 5. Results of laser tattoo removal over a course of treatment. Patients are generally treated over a period of months (6-20 sessions) with a variety of laser wavelengths depending on the color of the inks used. Wrinkles and resurfacing. Laser skin resurfacing, called "ablative", used to involve damaging a large surface of skin with a CW CO2 (10600 nm) laser with the expectation that the new epidermis formed would have fewer defects. Although highly effective, the risk of unwanted side effects was high, with unwanted thermal damage and scarring. When it was realized the appropriate pulse duration needs to be less than 1 millisecond, the development of short-pulse, high-peak power, rapidly scanned CW CO2 (10600 nm) and normal mode Er:YAG (2940 nm) lasers provided the ability to accurately thermally ablate controlled layers of tissue. The prototype of nonablative rejuvenation is the infrared Nd:YAG CoolTouch laser at 1320 nm with a pulse duration of 200 microseconds and, more recently the SmoothBeam diode laser at 1450 nm. These lasers produce mild but reproducible improvement in wrinkles and scars, with histologic evidence of neocollagenesis 6 months after treatment.The healing time was much shorter than ablative resurfacing (Arndt et al., 2006). Fractional photothermolysis. Fractional laser is based on the discovery that a large number of very small lesions (about 100 micron diameter) separated by uninjured skin (lesions are about 200 micron apart) heal much faster (24 hours compared to 14 days) than one large lesion that covers exactly the same total area (Jih & Kimyai-Asadi, 2008). The microscopic thermal injury zones of controlled width, depth, and density are produced by computer controlled pulsed or scanned lasers. For skin resurfacing and wrinkle removal applications where it is desired to stimulate a wound healing response in the damaged skin and to encourage new collagen production by dermal fibroblasts, the fractional laser seems to work very well. Scar removal. There are several laser systems available that permit the successful treatment of various types of scars. The 585 nm PDL remains the gold standard for the laser treatment of hypertrophic scars and keloids. Although atrophic scars may best be treated with ablative CO2 (10600 nm) and Er:YAG (2940 nm) lasers, the intense interest in procedures with reduced morbidity profiles have increased the popularity of nonablative and fractional laser procedures (Alster et al., 2007). * Cauterize (seal) blood vessels to prevent excessive bleeding. Advantages of laser surgery. Often referred to as "bloodless surgery," laser procedures usually involve less bleeding than conventional surgery. The heat generated by the laser keeps the surgical site free of germs and reduces the risk of infection. Because a smaller incision is required, laser procedures often take less time (and cost less money) than traditional surgery. Sealing off blood vessels and nerves reduces bleeding, swelling, scarring, pain, and the length of the recovery period. Lasers are used to cut, vaporize or coagulate tissues with little or no damage to surrounding areas. They are also beneficial in reaching otherwise inaccessible locations with less trauma, bleeding and scarring. In many cases, surgery with lasers results in reduced post-operative pain and less need for medication, shorter hospitalization and quicker return to routine activities. Sometimes described as "scalpels of light," lasers are used alone or with conventional surgical instruments in a diverse array of procedures that: improve appearance, relieve pain, restore function and save lives. * cardiology: laser angioplasty for angina (chest pain), transmyocardial revascularization, atrial fibrillation (Topol, 2003). * gastroenterology (treatment of disorders of the stomach and intestines): fragmentation of gallstones, stomach ulcers (Krasner, 1991). * gynecology: ectopic pregnancy (development of a fertilized egg outside the uterus), ovarian cysts, endometriosis, fibroid tumors (Wright et al., 1993). * neurosurgery: brain tumors (malignant and benign), vascular and neural anastamosis (Jeffreys, 1992). * oncology (cancer treatment); cancerous or non-cancerous tumors that cannot be removed by traditional surgery. * orthopedics (treatment of disorders of bones, joints, muscles, ligaments, and tendons) (Garrick, 1995). * otolaryngology (treatment of disorders of the ears, nose, and throat), stop snoring, remove tonsils, stop nosebleeds. * pulmonary care (treatment of disorders of the respiratory system). * urology (treatment of disorders of the urinary tract and of the male reproductive system): laser lithotripsy, non-cancerous enlargement of the prostate gland (Baba et al., 2006). Disadvantages of laser surgery. Although many laser surgeries can be performed in a doctor's office rather than in a hospital, the person guiding the laser must be at least as thoroughly trained and highly skilled as someone performing the same procedure in a hospital setting. Imprecisely aimed lasers can burn or destroy healthy tissue (Goldberg, 2008). 6.3. Dentistry. Lasers are used by dentists to treat cold and canker sores, gum disease, and tooth sensitivity or decay. Each wavelength has a somewhat unique effect on dental structures, due to the specific absorption of that laser energy in the tissue. Some lasers are only absorbed by blood and tissue pigments, while others are only absorbed by water as well as "hard" tissue. Lasers produce light energy that can be absorbed by a target tissue, and this absorption process produces a thermal reaction in that tissue. Depending on the instrument's parameters and the optical properties of the tissue, the temperature will rise and various effects will occur. In general, most non-sporulating bacteria, including anaerobes, are readily deactivated at temperatures of 50 degrees C. The inflammatory soft tissue present in periodontal disease can be removed at 60 degrees C; moreover, hemostasis can also be achieved within the same heat parameters. Soft tissue excisional or incisional surgery is accomplished at 100 degrees C, where vaporization of intra- and extra cellular water causes ablation, or removal of biological tissue. Likewise, the aqueous component of tooth structure and bone also boils at this temperature; thus cavity preparation, calculus removal, and osseous contouring can proceed. 6.4. Ophthalmology. Lasers allow non-invasive treatment of diseases of the eye as well as vision correction. Three important applications of lasers in ophthalmology are illustrated in Figure 6. Vision correction utilizes an ultraviolet excimer (193 nm) laser to reshape the cornea in a process known as laser-assisted in situ keratomileusis (LASIK). Near-infrared Nd-YAG lasers (1064 nm) or argon lasers (488 nm) are used to treat glaucoma by relieving intra-ocular pressure. Argon lasers (488 nm) are also used to treat abnormal retinal blood vessels that are common in diabetics. glaucoma, mild-to-moderate nearsightedness and astigmatism, and other conditions that impair sight. Macular degeneration can also be treated with lasers. Age-related macular degeneration (AMD) is a disease that results in a breakdown of the macula accompanied by a loss of central vision. "Wet" AMD is characterized by leaky blood vessels. Laser photocoagulation is used to seal the blood vessels and restore vision. The procedure performed with a near-infrared Nd-YAG (1064 nm) laser involves thermal effects and may be accompanied by the damage of local tissue. Figure 6. Applications of lasers in ophthalmology. UV (193 nm) excimer laser is used to shape the cornea in a process known as laser-assisted in situ keratomileusis (LASIK) by sculpting the cornea to correct short-sightedness. Selective laser trabeculoplasty uses an argon (488 nm) or 810 nm diode laser to treat glaucoma by thermal injury of the trabecular meshwork at the corner of the eye. 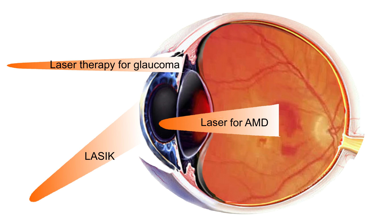 It is also possible to use an argon laser at 488 nm to treat age-related macular degeneration (AMD) by making small thermal lesions on the retina at the back of the eye. Ultraviolet (UV) light is electromagnetic radiation with a wavelength shorter than that of visible light, but longer than X-rays, in the range 400 nm to 10 nm, and energies from 3 eV to 124 eV. It is so named because the spectrum consists of electromagnetic waves with frequencies higher (wavelengths shorter) than those that humans identify as the color violet. wavelengths lower than 200 nm are highly absorbed by air (chiefly by oxygen) and can only be used in a vacuum so they are called vacuum UV. Nils Ryberg Finsen won the Nobel prize in 1903 for using UV light (then known as chemical rays) to treat lupus vulgaris (tuberculosis of the skin), and other skin diseases. Narrow band UVB (311 nm) is used for many similar indications to PUVA (see Section 8). UV phototherapy is used to treat the following skin conditions: psoriasis, polymorphous light eruption, solar urticaria, actinic reticuloid atopic eczema, vitiligo, pruritus, lichen planus, early cutaneous T-cell lymphoma, dermographism, and pityriasis lichenoides. UVC is highly antimicrobial and is under investigation for some superficial infections. Psoralens are a group of natural furanocoumarins, commercially derived from Ammi majus, a plant found in Egypt. They are also present in celery, carrots, parsley, parsnip and other vegetables. It has been known since ancient times that consumption of these foodstuffs followed by sun exposure can lead to a phototoxic skin reaction similar to sunburn. The first application of psoralen photochemotherapy was in Egypt in 1948 by el Mofty, who used purified 8-methoxypsoralen (8-MOP) plus sunlight exposure in the treatment of vitiligo (Monem El Mofty, 1948). Two young American dermatologists (Aaron Lerner and Thomas Fitzpatrick) were intrigued by this report, and determined that long wavelength ultraviolet (320-400 nm, UVA) light was the most efficient for activating 8-MOP (Lerner et al., 1953).The development of artificial UVA sources enabled the efficient delivery of these photons to skin containing 8-MOP, and the therapy became known as PUVA (psoralen and UVA) (Langner et al., 1976). PUVA's major success was in treating psoriasis (Parrish et al., 1974), an inflammatory skin disease involving hyperproliferation or skin thickening, and the development of itchy and scaly lesions or "plaques". This disease is now known to have an autoimmune component where autoreactive T-cells attack the bodies' normal skin cells. Psoralens can be taken orally or applied topically. The commonest psoralen is 8-methoxypsoralen (8-MOP, Methoxsalen, Oxsoralen tablets, Puvapsoralen lotion/paint). 8-MOP is also used for bathwater soaks. 5-Methoxypsoralen (5-MOP, Bergapten, Psoraderm) is used for very light-sensitive individuals, or for those with intolerance to 8-MOP. Trimethylpsoralen (TMP, Trioxsalen, Tripsor) is used more in bathwater soaks. The light sources used for PUVA tend to be UVA fluorescent tubes made by Philips. They are generally constructed in a whole-body illumination "box" (Figure7). Figure 7.Three views of a PUVA cabinet fitted with UVA emitting tubes for whole body irradiation. There are more specialized light sources designed just to illuminate the hands (Figure 8). Figure 8. PUVA unit for treating hands. Figure 9. Interstrand DNA cross-linking due to psoralens and UVA. The psoralen molecule can intercalate into double-stranded DNA, and has two reactive groups that each can react with a nucleic acid base, producing cross-links between two opposing strands (from The University of Kentucky). This DNA damage causes cellular apoptosis via p53 activation in a similar manner to other well-known DNA damaging agents. Because the penetration depth of UVA light into the skin is limited, PUVA damage is confined to the epidermis, which is often thickened in the case of psoriasis. However, there is another different mechanism that operates in addition to the DNA-cross-linking effect of PUVA. This mechanism involves the inflammatory process, and also the alteration of the host immune system. Many cytokines are increased in the skin after PUVA and circulating leucocytes (especially T-cells) tend to be killed. These dual mechanisms mean that PUVA can be used for many different skin disorders in addition to vitiligo and psoriasis such as: atopic dermatitis, atopic eczema, mycosis fungoides, and cutaneous T-cell lymphoma. However, it was found that there is a major side-effect of long-term use of PUVA, in that it causes skin-cancer (mainly squamous cell carcinoma) (Stern et al., 1984). A second major application of the combination of psoralen and UVA is what is known as extracorporeal photopheresis or photochemoimmunotherapy. In this therapy psoralens are administered to the patient orally in the same way as PUVA, but instead of shining UVA light on the skin, some blood is withdrawn from the arm and passed through an ex vivo UVA illuminator, before being re-infused into the arm (Knobler, 1987). LLLT is an emerging medical and veterinary technique in which exposure to low-level laser light or light emitting diodes might stimulate or inhibit cellular function, possibly leading to beneficial clinical effects. The use of low levels of visible or NIR light for reducing pain, inflammation and edema, promoting healing of wounds, deeper tissues and nerves, and preventing tissue damage has been known for almost forty years since the invention of lasers (Karu, 1998). Despite many reports of positive findings from experiments conducted in vitro, in animal models, and in randomized controlled clinical trials, LLLT remains controversial. Tiina Karu has proposed (see Photobiological Sciences Online unit entitled "Action Spectra: Their Importance for Low Level Light Therapy") that mitochondria are a likely site for the initial effects of light, specifically that the enzyme cytochrome c oxidase (unit four in the mitochondrial respiratory chain) absorbs photons and increases its activity leading to increased ATP production, modulation of reactive oxygen species and induction of transcription factors (Turrens, 2003). Several transcription factors are regulated by changes in cellular redox state. Among them redox factor-1 (Ref-1) dependent activator protein-1 (AP-1) (Fos and Jun), nuclear factor κB (NF-κB), p53, activating transcription factor/cAMP-response element-binding protein (ATF/CREB), hypoxia-inducible factor (HIF)-1α, and HIF-like factor. However, it was also shown that low levels of oxidants appear to stimulate proliferation and differentiation of some type of cells (Alaluf et al., 2000; Kirlin et al., 1999; Yang et al., 1996). These effects in turn lead to increased cell proliferation and migration (particularly by fibroblasts), modulation in the levels of cytokines, growth factors and inflammatory mediators, and increased tissue oxygenation (Pastore et al., 1994). The results of these biochemical and cellular changes in animals and patients include such benefits as increased healing in chronic wounds, improvements in sports injuries and carpal tunnel syndrome, pain reduction in arthritis and neuropathies, and amelioration of damage after heart attacks, stroke, nerve injury and retinal toxicity (Hamblin et al., 2006). Figure 10 shows the mechanism and application of LLLT. Figure 10. LLLT mechanism and application. 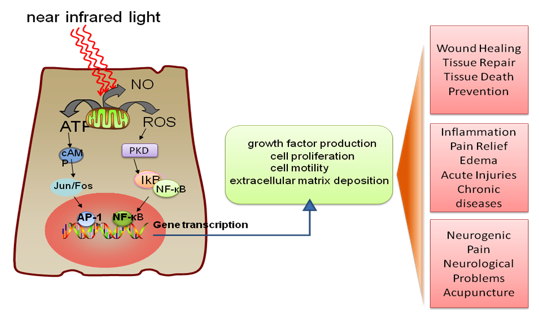 Incoming red and NIR photons are absorbed in cell mitochondria, producing reactive oxygen species (ROS) and releasing nitric oxide (NO), which leads to gene transcription via activation of transcription factors (NF-κB and AP1). 9.1. LLLT for pain relief, inflammation and healing. In recent years, there has been growing interest in the use of laser biostimulation as a therapeutic modality for pain management (Strong, 2002). Alterations in neuronal activity have been suggested to play a role in pain relief by laser therapy. Many published reports document the positive findings for laser biostimulation in pain management. This level of evidence relates to chronic neck pain (Chow et al., 2005), tendonitis (Bjordal et al., 2006), chronic joint disorders (Bjordal et al., 2003), musculoskeletal pain (Gerber et al., 2001), and chronic pain (Aronoff, 1999). Randomised controlled trials provide evidence for the efficacy of laser therapy in chronic low back pain (Frazer et al., 2003). LLLT has been used clinically since 1981 for the treatment of patients with inflammatory pathologies. LLLT was conducted on different animal models of inflammatory disorders. LLLT have been reported to have a significant effect on carpal tunnel syndrome treatment, mucositis, arthritis, and ulceration. The literature on LLLT applied to the stimulation of wound healing in a variety of animal models contains both positive and negative results. The reasons for the conflicting reports, sometimes in very similar wound models, are probably diverse. It is probable that applications of LLLT in animal models will be more effective if carried out on models that have some intrinsic disease state. LLLT significantly improves wound healing in both diabetic rats and diabetic mice. LLLT was also effective in X-radiation impaired wound healing in mice. Furthermore, the total collagen content was significantly increased at 2 months, when compared with control wounds. The beneficial effect of LLLT on wound healing can be explained by considering several basic biological mechanisms, including the induction of the expression of cytokines and growth factors known to be responsible for the many phases of wound healing. Figure 11 shows the mechanism of LLLT on wound healing (Lucas et al., 2002). Figure 11. LLLT for Wound Healing. Cells in the wound respond to light induced reactive oxygen species (ROS) leading to the expression of growth factors, such as transforming growth factor beta (TGF), and platelet derived growth factor (PDGF), which encourage synthesis of more collagen, increased formation of blood vessels, and less inflammation, all of which increase wound healing. 9.2. LLLT in the central nervous system. Low level laser/light therapy (LLLT) for neurological disorders in the central nervous system (CNS) is currently an experimental concept. The broad goals for clinical utilization are the prevention and/or repair of damage, relief of symptoms, slowing of disease progression, and correction of genetic abnormalities. Experimental studies have tested and continue to test these goals by investigating LLLT in animal models of diseases and injuries that affect the brain and spinal cord. Successful clinical trials have been carried out for transcranial laser therapy for stroke. Discoveries concerning the molecular basis of various neurological diseases, combined with advances that have been made in understanding the molecular and cellular mechanisms in LLLT, both in vitro and in vivo, have allowed rational light-based therapeutic approaches for a wide variety of CNS disorders to be investigated. Neurodegenerative diseases are caused by the deterioration of certain nerve cells (neurons), such as occurs in Alzheimer's disease, Parkinson's disease (Trimmer et al., 2009), and Amyotrophic Lateral Sclerosis (Moges et al., 2009), as well as multiple sclerosis, are all due to neuronal degeneration in the central nervous system (Friedlander, 2003). The chronic, unrelenting, progressive nature of these devastating degenerative diseases has motivated the search for therapies that could slow down or arrest the downward course experienced by most patients, and even more desirable would be a therapy that could actually reverse the neuronal damage. Transcranial light therapy is considered to have the potential to accomplish these goals as depicted in Figure 12. Limitations in knowledge are still apparent, such as the optimal wavelength, light source, doses, pulsed or CW, polarization state, treatment timing and repetition frequency. Collaborative efforts between clinicians and basic researchers will likely increase the usage and understanding of effective laser-based therapies in the CNS (Lampl, 2007). Figure 12. LLLT for central nervous system (CNS) neurological disorders. NIR light can penetrate through the skull into the brain, reducing neuronal cell death, reducing inflammation and increasing the likelihood of neurogenesis. The retinal nerves and the spinal cord are classified as part of the CNS, and light is delivered for similar reasons into the eye or to the neck or back at the site of the spinal cord lesion. PDT is a treatment for cancer and other diseases characterized by unwanted tissues or cells (Hamblin et al., 2008). PDT utilizes the combined effect of light, a photosensitizing dye (i.e. a substance that absorbs visible light) and molecular oxygen. The dye, harmless in itself, is administered either systemically, locally, or topically to a patient bearing a lesion (frequently but not always cancer), a few minutes to a few days ahead of time. The clearance of dye from normal tissue and the accumulation of dye in tumor tissue enables tumor visualization by fluorescence, as well as selective treatment. The tumor is illuminated with visible light. The light is applied at a low energy level and is harmless by itself. The illumination of the lesion with visible light (usually long wavelength red light), leads in the presence of oxygen to a transfer of energy from photo-excited dye molecules to oxygen molecules. This process results in the production of a highly reactive type of oxygen, and consequently to cell death and tissue destruction. Most of the reports of applications of PDT for treating clinical disease have been as a cancer treatment, but in recent years a multitude of different non-malignant conditions have also been proposed to be amenable to PDT. 10.1. PDT for cancer. It has been known since early in the century that injection of certain photosensitizing drugs or dyes especially those compounds derived from the naturally occurring porphyrins, followed by exposure to sunlight could produce phototoxic reactions that could be severe enough to cause tissue necrosis. A German physician Friedrich Meyer Betz became highly photosensitive after injecting himself with 200 mg of hematoporphyrin (Moan et al., 2003) (Figure 13). Figure 13. 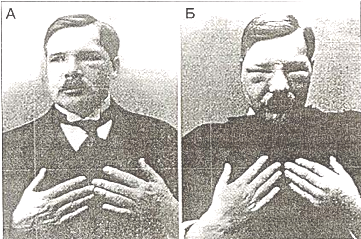 (A) Friedrich Meyer Betz before, and (B) after self-injection of hematoporphyrin, and exposure to sunlight. The first suggestion that the combination of the tumor-localizing and the phototoxic properties of porphyrins such as HP and HpD might be exploited to produce an effective treatment for cancer was reported in 1972 in The Lancet by Diamond and co-workers (Diamond et al., 1972) from San Francisco. These authors had originally wondered whether porphyrins might potentiate the effects of ionizing radiation (X-rays), but having found that this was not the case, went on to test the hypothesis that HP may serve as a selective photosensitizing agent to destroy cancer exposed to light. This concept is depicted in Figure 14. Figure 14. Schematic depiction of the stages of PDT treatment for a patient with cancer. Photosensitizer (PS) is injected usually into the bloodstream, and distributes around the body. After some time, the PS tends to be cleared from normal tissues, but is retained in cancerous tissue, due to various abnormalities in tumors. This is thought to be the most advantageous time to deliver light. They found a marked reduction in tumor volume following light exposure delivered 24 h after systemic HP administration. Tumor growth was suppressed for 10-20 days, but regrowth then occurred from viable areas remaining in deeper regions of the tumor. Histological examination showed coagulation necrosis in all but the deepest regions of the tumors. Neither HP alone, nor light alone produced any effect. The authors concluded that PDT offered a new approach to the treatment of brain tumors and other neoplasms resistant to other therapies. Since then there have been numerous papers published on the application of PDT in oncology, and on the number of types of tumors treated with this procedure (summarized in Table 2). Table 2. 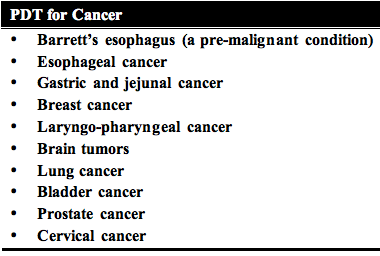 List of common tumor types that have been treated by PDT. One of the most interesting phenomena observed in the PDT treatment of cancer is the potential to induce strong and long lasting anti-tumor immune response. It has been known for some years that under certain conditions, PDT can not only destroy the primary tumor that receives illumination, but also sensitize the host immune system to recognize and potentially destroy any remaining tumor cells, whether left at the site of the primary tumor or present as distant metastases (Figure 15). Figure 15. How the immune system is activated after PDT. When light (hν) is delivered to PS loaded tumors this induces both apoptotic and necrotic cell death. These dead and dying tumor cells are phagocytosed by dendritic cells (DC) that have accumulated owing to the acute inflammatory response triggered by PDT. Stimulated by cytokines released at the site of inflammation, DCs mature and home to the regional lymph nodes where they present antigens to the naive T lymphocytes. Activated lymphocytes become tumor-specific effector T-cells and, attracted by chemokines, migrate to the tumor and kill the remaining tumor cells. Successful PDT of tumors growing in immunocompetent syngeneic mice can in some cases cause a long-term memory anti-tumor immunity, as demonstrated by a resistance to a rechallenge with the tumor from which they were cured, but not a different syngeneic tumor (Canti et al., 1994; Hendrzak-Henion et al., 1999; Korbelik et al., 1999). This effect is not observed when the same tumors are grown in immunosuppressed mice (Korbelik et al., 1996). Splenocytes adoptively transferred from immunocompetent mice cured of tumors by PDT can restore the curative effect of PDT in immunosuppressed animals, and demonstrate specific lysis of tumor cells growing in vitro in a classical cytotoxic T lymphocyte assay. Tumor cells killed with PDT in vitro are more effective as tumor vaccines than the same cells killed by other methods (Gollnick et al., 2002). PDT has effects on cancer cells that make immune activation more likely in an in vivo tumor treated with PDT. These are the particular mixture of necrotic and apoptotic cell death caused by PDT, and the fact that necrotic cell death is more immunogenic compared to apoptotic cell death (Melcher et al., 1999), which can be immunosuppressive (Voll et al., 1997). PDT can induce the strong expression of heat shock proteins (especially HSP70) (Gomer et al., 1996; Korbelik et al., 2005; Mitra et al., 2003) that has been shown to potentiate immune recognition of tumors. PDT can cause activation of the transcription factors nuclear factor kappa B (NFκB) (Granville et al., 2000), and activator protein (AP)-1 (Kick et al., 1996) leading to production of a large variety of inflammatory mediators including eicosanoids, interleukins (IL) 1, 6, 8 and 10. Neutrophils are an important cell type for the PDT response (Sun et al., 2002), and if mice are depleted of neutrophils before PDT, the curative effect is lost (de Vree et al., 1996). Following the initial invasion of neutrophils into PDT treated tumors there is an increase in mast cells and macrophages (Krosl et al., 1995). Complement activation is also observed both in the tumor and serum after PDT (Cecic et al., 2005). 10.2. PDT for ophthalmology. Although PDT was initially designated as an anti-cancer treatment, probably its most successful clinical application is in ophthalmology, namely as a treatment of choroidal neovasculature (CNV) associated with age related macular degeneration (AMD) (Fenton et al., 2006; Schmidt-Erfurth et al., 2000; van den Bergh et al., 2002a; van den Bergh et al., 2002b; Wormald et al., 2007). PDT with Verteporfin (Visudyne) was really the first approved therapy for treating the subfoveal lesions. It was a ground breaking discovery that has profoundly changed the history of this disease and saved several hundreds of thousands of eyes from blindness, since 2000. For PDT of subfoveal CNV, freshly made Verteporfin solution, which is reconstituted from the lyophilized drug, is intravenously injected over a 10-minute period. 15 minutes after the start of the perfusion, the excitation light is applied to the retina from a diode laser at a wavelength of 689 nm. The fluence rate at the retina is adjusted to be 600 mW/cm2, which is delivered over 83 seconds giving a fluence of 50 J/cm2. There are multiple aspects of the selectivity in the angio-occlusion of CNV in AMD by photodynamic therapy. In the first place there is the selectivity of vascular damage and the subsequent blood flow stasis. This selectivity is inherent in the short time interval between the drug injection and the light application, i.e., 15 minutes after the start of the intravenous injection of the Visudyne, when the 83 second irradiation takes place, most of the drug that is in the retina is still within the blood vessels, and more specifically, on or in the endothelial cells lining the CNV, which are to undergo the angioocclusion. Thus, the main photodynamic effect takes place in the endothelium being irradiated. A second possible reason for the "selective" vaso-occlusion comes from the difference in Visudyne retention by vessels. It has been shown that at the time of irradiation, the retinal capillaries appear to have much less drug in them than the CNV and choroidal vessels in general. This may well imply a significant level of protection of the retinal capillaries. PDT for treating CNV associated with AMD remains now a standard therapy for patients with recent progression of wet AMD with subfoveal CNV. The treatment is safe, and has a proven long-term effect, and needs hardly any re-treatments after the first few years, which put PDT apart from other available treatments for AMD. 10.3. PDT in dermatology. Mainstream uses for PDT in dermatology include non-melanoma skin cancer and its precursors such as actinic keratosis, acne, photorejuvenation and hidradenitis suppurativa. Many other dermatologic entities have been treated with PDT, and published in the literature. These include psoriasis, cutaneous T-Cell lymphoma, disseminated actinic porokeratosis (DSAP), localized scleroderma, and vulval lichen sclerosus, bacterial infections and verruca vulgaris (Table 3). Table 3. Dermatologic conditions treated by PDT. Dermatology is a specialty in which both laser and non-laser light sources are commonly used clinically for PDT. The fact that the skin is an organ of large surface area, and in general lesions are relatively superficial but in certain circumstances can be large, has acted as an impetus for companies to develop non-coherent lamps and diode arrays that operate in both pulsed and CW modes. Most applications of PDT in dermatology utilize an alternative to systemic injection of a PS in a process in which a metabolic precursor 5-aminolevulinic acid (ALA) is administered and the PS protoporphyrin IX (PPIX) is synthesized in situ in tumors and tissue (Peng et al., 1997). ALA interacts with the heme biosynthetic pathway shown in Figure 16. Figure 16. ALA-induced PPIX. Schematic illustrating the interaction of the heme biosynthesis pathway with exogenous ALA to give intracellular PPIX. Abbreviations are ALA-D = ALA dehydratase; ALA-S = ALA synthetase; Coprogen III = coproporphyrinogen III; CPO = coproporphyrinogen oxidase; FCH = ferrochelatase; HMB = hydroxymethylbilane, PBG-D = porphobilinogren deaminase; protogen III = protoporphyrinogen; PPO = protoporphyrinogen oxidase; Urogen III = uroporphyrinogen III; UCS = uroporphyrinogen cosynthase, UGD = uroporphyrinogen decarboxylase. Almost all types of cells of the human body, with the exception of mature red blood cells, are equipped with this metabolic machinery. In the first step of the pathway, ALA is formed from glycine and succinyl-CoA. 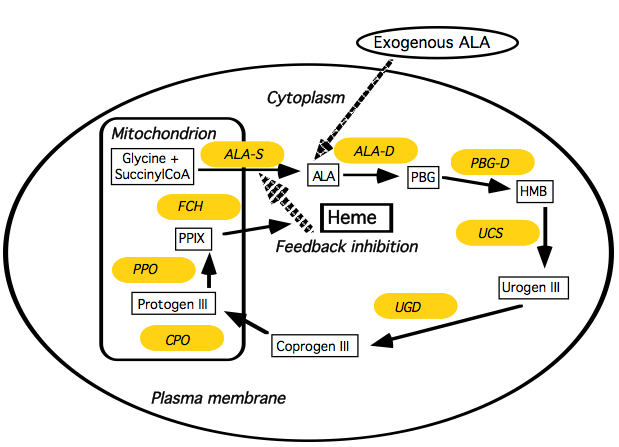 The synthesis of ALA by ALA-synthetase is under feedback regulation by the amount of heme in the cell. The last step in the pathway is incorporation of iron into PPIX to form heme catalyzed by the enzyme ferrochelatase, and this is rate-limiting. By adding exogenous ALA, the feedback inhibition is bypassed, and PPIX will accumulate because of the limited capacity of ferrochelatase to transform PPIX to heme. Free PPIX is a good PS that effectively causes apoptosis of cells after illumination. PPIX is initially formed in the mitochondria of cells, but rapidly diffuses to other intracellular membrane sites. In vivo, the ALA may be administered orally (van den Boogert et al., 1998), intravenously (Svanberg et al., 1996), or topically (Calzavara-Pinton, 1995). The reasons why cancer cells tend to synthesize more PPIX than normal cells, has been much investigated. Hypotheses include greater expression of heme biosynthesis enzymes, porphobilinogen deaminase (Gibson et al., 1998), coproporphyrinogen oxidase (Ortel et al., 1998), or reduced expression of ferrochelatase (Van Hillegersberg et al., 1992), but increased delivery of ALA to the tumor may play a role especially in topical applications (Szeimies et al., 1994). Based on available literature, it appears that ALA-PDT seems to be a safe and a suitable alternative for a variety of conditions encountered in dermatology practice. The technique is effective in patients of all ages and results in clinical and cosmetic improvement. Visible light sources, in particular lasers and pulsed lasers can be used to activate the ALA with the added benefit of improvement in the quality of treated skin. 10.4. PDT for infectious disease. The increasing occurrence of multi-antibiotic resistant microbes has led to the search for alternative methods of killing pathogens and treating infections. Photodynamic therapy (PDT) uses the combination of non-toxic dyes and harmless visible light to produce reactive oxygen species that can kill mammalian and microbial cells. There were many reports of photodynamic inactivation (PDI) of various species of bacterial and fungal cells, as well as viruses, over the years between the discovery of antimicrobial PDI in 1904 and 1990. In the 1990s it was observed that fundamental differences in susceptibility to PDT exist between Gram (+) and Gram (-) bacteria. This was explained by differences in their morphology: the cytoplasmic membrane in Gram (+) cells is surrounded by a layer of only peptidoglycan and lipoteichoic acid, which is relatively porous; while Gram (-) bacteria have a somewhat more intricate, non-porous cell wall structure consisting of an inner cytoplasmic membrane and an outer membrane, which are separated by the peptidoglycan-containing periplasm. It was discovered that in general, neutral or anionic PS molecules are efficiently bound to and mediate the photodynamic inactivation (PDI) of Gram (+) bacteria (Malik et al., 1992), but they are not able to photoinactivate Gram negative bacteria. The latter can be achieved by employing several different techniques. It is possible to use agents that are capable of increasing the permeability of the cell outer membrane such as polymyxin B nonapeptide (Nitzan et al., 1992), or EDTA (Bertoloni et al., 1990) together with traditional PS. Alternatively one can use a PS molecule with an intrinsic positive charge (Merchat et al., 1996; Minnock et al., 2000), or polycationic PS conjugates formed from polymers such as polylysine (Hamblin et al., 2002; Lauro et al., 2002; Rovaldi et al., 2000; Soukos et al., 1998). Several studies have shown that antibiotic resistant bacteria are as susceptible to PDI as their naive counterparts (Wainwright et al., 1998; Wilson et al., 1995). The nature of the PDI-induced damage that involves oxidative modification of vital cellular constituents, suggests that bacteria will not easily be able to develop resistance mechanisms, and one study has shown that resistance to PDI does not occur (Lauro et al., 2002). The demonstration of efficient PDI of multiple classes of microorganisms, together with concern about rapidly increasing emergence of antibiotic resistance amongst pathogenic bacteria, has suggested that PDT may be a useful tool to combat infectious disease (Hamblin et al., 2004). Nonetheless there are several limitations. Because the delivery of visible light is almost by definition a localized process, PDT for infections is likely to be applied exclusively to localized disease, as opposed to systemic infections such as bacteremia. The key issues to be addressed with PDT are the effectiveness of the treatment in destroying sufficient numbers of the disease causing pathogens; selectivity of the PS for the microbes, thus avoiding an unacceptable degree of PDT damage to host tissue in the area of infection; and the avoidance of regrowth of the pathogens from a few survivors in the time following the treatment. PDT for infectious disease is likely to be a growing clinical application. With the increasing international concern about multi-drug resistant bacteria, and the specter of infectious diseases that have become untreatable by antibiotics constantly discussed by the popular media, alternative antimicrobial therapies have become a "hot topic". The rapid bacterial killing typical of PDT and the unlikelihood of bacteria developing resistance to PDT suggests that PDT should be at the forefront of new therapies for infectious disease. 10.5. PDT for cardiovascular disease. PDT has been applied in cardiovascular medicine for two broad indications; treatment of atherosclerosis (photoangioplasty) and inhibition of restenosis due to intimal hyperplasia after vascular interventions. Atherosclerosis and its thrombotic complications (atherothrombosis) are the leading cause of morbidity and mortality in industrialized countries. Atherothrombotic cardiovascular disease is a diffuse condition involving the coronary arteries, carotid arteries, aorta and peripheral arteries (Figure 17). Figure 17. Human vascular system. Atherosclerosis is a systemic disease affecting the whole body and causing major diseases. 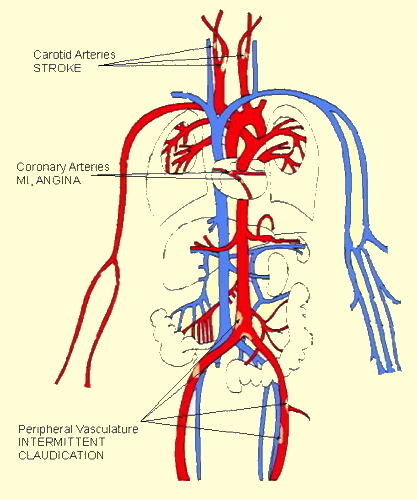 Red color indicates arterial vessels, and blue the venous circulation. Claudication indicates pain arising due to deprivation of the muscles of blood flow by vascular blockages, usually in the legs. However, the pathology of the disease and clinical consequences vary in the different anatomical locations. In patients with atherothrombotic disease, myocardial ischemia or infarction causes as much as 70% of deaths (Fowkes et al., 1991). Cerebrovascular disease causes approximately 10% to 17% of deaths in these patients, and another 10% are caused by ruptured aneurysms or visceral infarctions. Peripheral arterial disease may be viewed as benign, because it does not cause direct mortality. Thus symptomatic individuals (i.e., those presenting with claudication) have a history of myocardial infarction or stroke in 20% to 30% of cases, and evidence of underlying coronary disease in 50% to 70% of cases. The main lesion in atherosclerotic disease is called an atherothrombotic plaque (Stary et al., 1995a, 1995b) (Figure 18). Figure 18. Schematic diagram of an atherosclerotic plaque. The build-up of the lesion can eventually lead to arterial obstruction that limits blood flow, or alternatively can rupture causing catastrophic thrombosis in the coronary arteries. 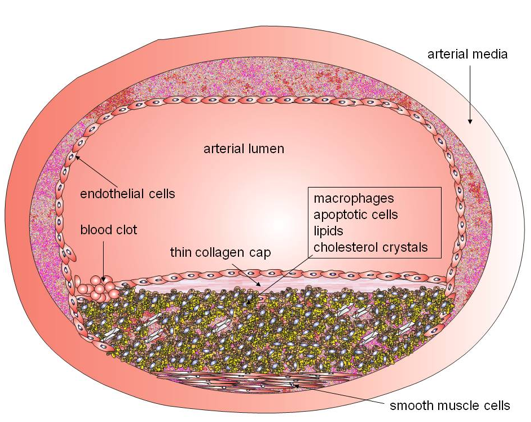 The atherosclerotic plaque is made of following components: 1) extracellular matrix, including collagen, proteoglycans, and fibronectin elastic fibers; 2) crystalline cholesterol, cholesteryl esters, and phospholipids; 3) cells such as monocyte-derived macrophages, T-lymphocytes, and smooth-muscle cells; 4) thrombotic material with platelets and fibrin deposition. (Moreno et al., 2004a, 2004b). Atherosclerosis progresses through lipid core expansion and macrophage accumulation at the edges of the plaque, leading to fibrous cap rupture. Muller (Muller et al., 1994) suggested that plaque rupture, superimposed by occlusive thrombosis, as the underlying mechanism for the majority of sudden cardiac deaths, particularly in young men. Myocardial infarction (MI) frequently develops on lesions with pre-existing non-critical stenoses, and attention has turned to the angiographically non-significant lesions in the last decade; "vulnerable plaque" is used to identify all thrombosis-prone plaques and plaques with a high probability of undergoing rapid progression, thus becoming culprit plaques (Naghavi et al., 2003). The recent renewal of interest in the therapeutic potential of cardiovascular PDT has been prompted largely by the availability of new agents such as lutetium texaphyrin (also known as motexafin lutetium or Antrin) with selective localization, greater PDT efficiency, and minor, self-limited potential for cutaneous phototoxicity are now available. Photoangioplasty is a term for the combination of intravenous injection (IV) of PS followed by delivery of intravascular light by a fiber optic catheter introduced into a blood vessel and then advanced to the lesion. However, due to the fact that blood will have to continue to circulate through the vessel during the illumination, and blood is an efficient optical quencher of light, relatively large fluences have to be delivered from diffusing tips of several cm in length, necessitating lasers of considerable power. A phase I trial of photoangioplasty in intermittent claudication with peripheral arterial atherosclerosis suggested (Rockson et al., 2000) that the therapy is well tolerated and has the capacity to invoke a therapeutic response in these patients. In 90% of vessels treated, intravascular ultrasonography confirmed measurable improvement in lumen cross-sectional area after Antrin photoangioplasty. A second phase I trial (Kereiakes et al., 2003) looked at drug and light dose-escalation of motexafin lutetium (MLu), and far red light activation (phototherapy) in subjects with coronary artery disease undergoing percutaneous coronary intervention and stent deployment. The therapeutic changes were achieved without documented adverse vascular responses or any treatment limiting phototoxicity. 11.1. Seasonal affective disorder. 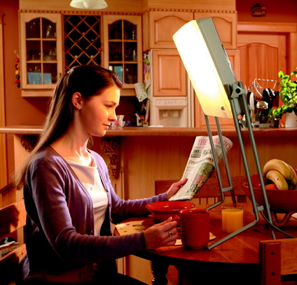 While full sunlight is preferred for seasonal affective disorder, there are a number of products (such as light boxes) using very intense artificial illumination that are effective for seasonal affective disorder (Terman et al., 1990) (Figure 19). Newer research indicates that using a lower intensity of certain wavelengths of light, i.e., the "blue" wavelengths, may be at least as effective as using 10,000 lux (Wirz-Justice et al., 1993), at least until one approaches old age, when blue light is no longer more effective than red or green. The most effective wavelengths of blue light are given as ranging between 460 nm and 485 nm by most sources, with some sources specifying peak photopigment sensitivity at 479 nm (in mice). Figure 19. Sun Touch Plus 10,000 lux bright light therapy device. 11.2. Non-seasonal depression. Only recently have clinical studies been conducted that specifically excluded all patients with any degree of seasonality (Yamada et al., 1995). Before these studies, there was suspicion that any depressed patients who benefited from light treatment were really only having the SAD component of their depression treated. However, light therapy is now an established treatment for depression, regardless of seasonality (Tuunainen et al., 2004). One advantage it may have compared with drugs is that results may appear more quickly; antidepressant drugs typically take several weeks to reach full effectiveness. Combination of light and medicine has been proven to be more effective and faster than either alone (Kripke, 1998). Light therapy has been tested in the following psychiatric disorders: premenstrual dysphoric disorder (Parry et al., 1989), antepartum postpartum major depressive disorder, antepartum and postpartum major depressive disorder, bulimia nervosa (Lam et al., 1994), and adult attention-deficit disorder. 11.3. Delayed sleep phase syndrome. In the treatment of delayed sleep phase syndrome (DSPS), the timing of light exposure is critical (Gruber et al., 2007). The light must be provided as soon after spontaneous awakening as possible to achieve the desired effect, as shown by the phase response curve for light in humans. Some users have reported success with lights that turn on shortly before awakening (dawn simulation). 11.4. Jet lag. Light therapy is considered a viable treatment for jet lag (Sack et al., 2007). Exposure to bright light during the appropriate time periods before, during and after air travel can reduce the symptoms of jet lag and accelerate the recalibration of the body clock. Neonatal jaundice is a condition that can occur in newborn infants, particularly when they are born prematurely. Bilirubin levels in the bloodstream of these infants become elevated, and this can lead to brain damage. Bilirubin is a normal breakdown product of hemoglobin, so it exists at low levels in all of us. In the bloodstream it is normally bound to a circulating plasma protein, albumin. If the ratio of bilirubin to albumin becomes too high, then unbound bilirubin in the bloodstream can enter tissues of the brain, and this can cause damage. 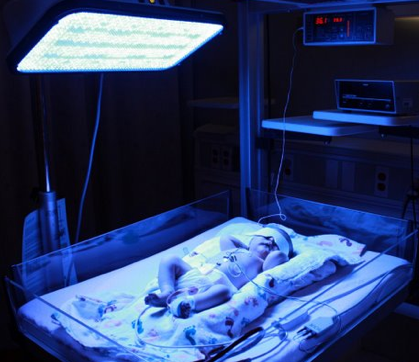 Neonatal jaundice can be treated with phototherapy. Blue light (450 nm to 500 nm) is applied to the skin of babies in order to keep the bilirubin concentration at a safe level (Figure 20). Blue light enhances the excretion of bilirubin, because it photoisomerizes the molecule. The photoisomer is more readily excreted than the unisomerized form (Maisels, 1990). Figure 20. Neonatal jaundice blue light therapy. 13.1. Lasers. Since the advent of the first laser, scientists and physicians have been working together to develop medical applications. The specificity of laser wavelengths, and the precision of fiber optic light delivery, have greatly enhanced the evolvement of non-invasive surgical techniques. Each laser has distinct uses depending on the wavelength and power output. The CO2 laser has an invisible far infrared output (10600 nm) that is strongly absorbed by water. It is used to make surgical incisions. Fiber optic delivery is not available for the CO2 laser so it is limited to external procedures. Several lasers emit invisible NIR light. The neodymnium (1064 nm), erbium (2940 nm) and holmium (2130 nm) "YAG" lasers are called "non-specific", because the light is not strongly absorbed by any tissue component. The weak absorption results in a deep penetration. Short, powerful pulses of NIR light are used in eye surgery. Several lasers emit light in the visible region. The light from dye laser (580 nm), KTP laser (532 nm) and argon lasers (488 nm) are absorbed by melanin and hemoglobin. They are useful for many procedures that require sealing off blood vessels. A major advantage of lasers is that coherent light can be easily coupled into flexible fiber optics that allow delivery of light anywhere in the body via endoscopes or transcutaneous insertion of fibers through needles. Excimer lasers emit invisible UV light. UV light is strongly absorbed by proteins and DNA. 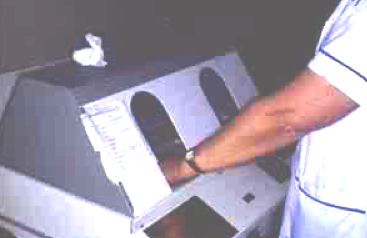 These lasers are often used for hard tissues (Csele, 2004). 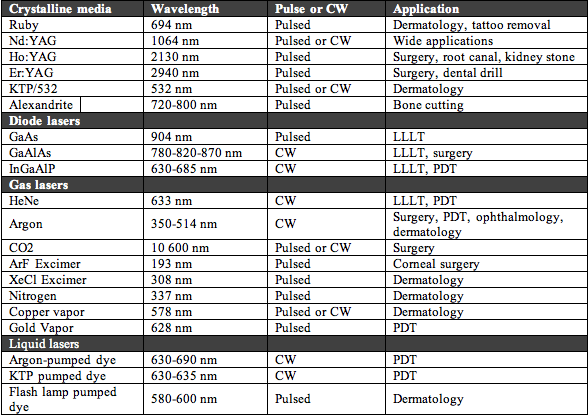 Table 4 lists the majority of lasers that have been used for medical applications. Figure 21 shows photographs of clinical lasers mainly used in dermatology. Table 4. Different kinds of lasers that have been used for medical treatments. Figure 21. Assortment of clinical lasers. (A) Q-switched ruby 694 nm made by Spectrum used for tattoo and pigmented lesion removal; (B) Long-pulse alexandrite 755 nm Candela Gentlelase used for removal of hair and vascular lesions; (C) Diode laser at 800 nm Luminis LightSheer, used for hair removal and leg vein treatment; (D) Q-switched Nd:YAG at 1064 nm ConBio Medlite used for removal of black & blue tattoos and pigmented lesions. 13.2. Lamps and fluorescent tubes. Broad spectrum lamps are used for some dermatological applications where it is desired to treat a large area. The spectral output of incandescent lamps is continuous throughout the infrared, visible and ultraviolet regions with a peak that depends on the temperature of the bulb. Filters are used to remove undesired wavelengths that can be either shorter (short-pass or cut-on) or longer (long-pass or cut-off) than the desired therapeutic range. The lamps used can be xenon, halogen or tungsten, depending on the wavelength range and power output desired. The beam is usually focused via parabolic reflectors and lenses. Lamps operate from 300 nm to 4.8 μm, and reflector types are offered with 4 coatings: hard dichroic, UV enhanced, gold, and aluminum (Figure 22A). Infrared heat lamps emitting a broad range of wavelengths between 1 and 1000 micron can be used to heat tissue according to its water content (Figure 22B). Narrow band UVB fluorescent tubes (311 nm) are fitted into cabinets for UVB phototherapy (Figure 22C) in a similar fashion to UVA tubes for PUVA. Figure 22. (A) Assortment of bulbs and lamps used in medical phototherapy. (B) Mid-infrared lamp used as a heat lamp. (C) Narrow band UVB phototherapy cabinet fitted with Philips TL-01 Narrowband UVB tubes. 13.3. Light emitting diodes (LEDS). Light-emitting diodes are revolutionizing the whole lighting industry. Their availability in almost any wavelength and with steadily increasing total output power means that light delivery applications, previously thought to require an expensive laser, can now be performed at a tiny fraction of the cost (less than 1%) by LEDS compared with the equivalent laser source. Not surprisingly, LEDs are becoming much more widely used in medical applications (Barolet, 2008). LEDS have several differences from lasers however. Firstly the output wavelengths are much less monochromatic than lasers, with a typical LED having a Full-Width Half-Maximum of 30 nm compared to 2 nm for a laser. Secondly LED light is non-coherent, so for LLLT applications where coherence is considered important, this may be an important difference. Thirdly, the light is non-collimated, and this makes it very difficult to focus it into a fiber optic cable for endoscopic and internal applications. On the other hand, it is much easier to illuminate large areas of the body with LED arrays than it is with lasers, as shown in Figure 23. Figure 23. Assortment of medical LED devices. (A) Omnilux LED device that can be fitted with blue, red or near infrared LEDs. (B) Gentle Waves yellow LED device for skin rejuvenation; (C) Red LED device for PDT of large areas. (D) Red LED device from Quantum devices. The human race has evolved to respond to light in both beneficial and harmful fashions. Although excessive exposure to sunlight (and in particular the UV component) can be damaging, by and large light exposure is considered beneficial, and most people like to go outside and feel better when exposed to sunlight. Modern scientific disciplines such as biomedical optics, photochemistry, photobiology, cell biology, laser physics, and engineering have all made major contributions to the development of photomedicine as a fully-fledged division of medical science. Light can be used to detect and diagnose medical conditions even deep within the body. The therapeutic uses of light are manifold. UV phototherapy and PUVA treat many skin diseases, especially those with immune components, and lasers are used in dermatology, ophthalmology, dentistry and general surgery (among other medical specialties). The combination of harmless light with non-toxic photosensitizing dyes is used in PDT to kill many undesirable cells, including malignant cancer cells and infectious microorganisms. Photobiomodulation or LLLT is used to stimulate healing, reduce tissue death, and relieve pain and inflammation. Intense light therapy is used for many psychiatric disorders. In the coming years we believe that photomedicine will only continue to grow as many investigational therapies attain regulatory approval and popular acceptance increases. Alaluf S, Muir-Howie H, Hu HL, Evans A & Green MR. (2000). Atmospheric oxygen accelerates the induction of a post-mitotic phenotype in human dermal fibroblasts: the key protective role of glutathione. Differentiation, 66, 147-55. Alster T & Zaulyanov-Scanlon L. (2007). Laser scar revision: A review. Dermatol Surg, 33, 131-140. Arndt KA & May JW. (2006). Cosmetic surgery, A to Z: a guide to common surgeries and skin treatments. Harvard Health Publications, Boston, MA. Aronoff GM. (1999). Evaluation and treatment of chronic pain. Williams & Wilkins: Baltimore, MD. Baba S & Ono Y. (2006). Interventional management of urological diseases. Springer; Berlin, Germany. Barolet D. (2008). Light-emitting diodes (LEDs) in dermatology. Semin Cutan Med Surg, 27, 227-38. Benaron DA, Cheong WF & Stevenson DK. (1997). Tissue optics. Science, 276, 2002-3. Bentolila LA, Ebenstein Y & Weiss S. (2009). Quantum dots for in vivo small-animal imaging. J Nucl Med. 50, 493-496. Bernstein EF. (2006). Laser treatment of tattoos. Clin Dermatol, 24, 43-55. Bertoloni G, Rossi F, Valduga G, Jori G & van Lier J. (1990). Photosensitizing activity of water- and lipid-soluble phthalocyanines on Escherichia coli. FEMS Microbiol. Lett., 59, 149-55. Bjordal JM, Couppe C, Chow RT, Tuner J & Ljunggren EA. (2003). A systematic review of low level laser therapy with location-specific doses for pain from chronic joint disorders. Aust J Physiother, 49, 107-16. Bjordal JM, Lopes-Martins RA & Iversen VV. (2006). A randomised, placebo controlled trial of low level laser therapy for activated Achilles tendinitis with microdialysis measurement of peritendinous prostaglandin E2 concentrations. Br J Sports Med, 40, 76-80. Brezinski ME. (2006). Optical coherence tomography: principles and applications. Academic Press; Boston, MA. Calzavara-Pinton PG. (1995). Repetitive photodynamic therapy with topical delta-aminolaevulinic acid as an appropriate approach to the routine treatment of superficial non-melanoma skin tumours. J Photochem Photobiol B, 29, 53-7. Canti G, Lattuada D, Nicolin A, Taroni P, Valentini G & Cubeddu R. (1994). Antitumor immunity induced by photodynamic therapy with aluminum disulfonated phthalocyanines and laser light. Anti-Cancer Drugs, 5, 443-447. Cecic I, Serrano K, Gyongyossy-Issa M & Korbelik M. (2005). Characteristics of complement activation in mice bearing Lewis lung carcinomas treated by photodynamic therapy. Cancer Lett, 225, 215-223. Chow RT & Barnsley L. (2005). Systematic review of the literature of low-level laser therapy (LLLT) in the management of neck pain. Lasers Surg Med, 37, 46-52. Csele M. (2004). Fundamentals of light sources and lasers. Wiley-Interscience, Hoboken, N.J.
Dall'Acqua F, Marciani S & Rodighiero G. (1970). 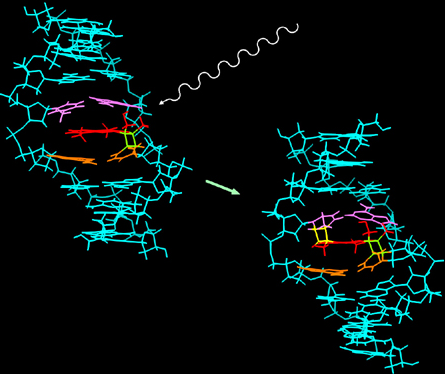 Inter-strand cross-linkages occurring in the photoreaction between psoralen and DNA. FEBS Lett, 9, 121-123.
de Vree WJ, Essers MC, de Bruijn HS, Star WM, Koster JF & Sluiter W. (1996). Evidence for an important role of neutrophils in the efficacy of photodynamic therapy in vivo. Cancer Res., 56, 2908-2911. Diamond I, Granelli SG, McDonagh AF, Nielsen S, Wilson CB & Jaenicke R. (1972). 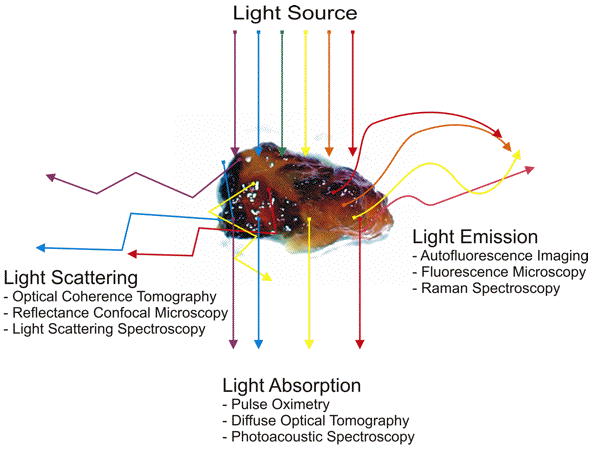 Photodynamic therapy of malignant tumours. Lancet, 2, 1175-7. Dunford R, Salinaro A, Cai LZ, Serpone N, Horikoshi S, Hidaka H & Knowland J. (1997). Chemical oxidation and DNA damage catalysed by inorganic sunscreen ingredients. FEBS Lett, 418, 87-90. Edelson RL. (1999). Sezary syndrome, cutaneous T-cell lymphoma, and extracorporeal photopheresis. Arch Dermatol, 135, 600-1. Fenton C & Perry CM. (2006). Verteporfin: a review of its use in the management of subfoveal choroidal neovascularisation. Drugs Aging, 23, 421-45. Fowkes FG, Housley E, Cawood EH, Macintyre CC, Ruckley CV & Prescott RJ. (1991). Edinburgh Artery Study: prevalence of asymptomatic and symptomatic peripheral arterial disease in the general population. Int J Epidemiol, 20, 384-92. Frazer MB, Norman RW, Wells RP & Neumann PW. (2003). The effects of job rotation on the risk of reporting low back pain. Ergonomics, 46, 904-19. Friedlander RM. (2003). Apoptosis and caspases in neurodegenerative diseases. N Engl J Med, 348, 1365-75. Garrick JG. (1995). The laser in orthopaedic surgery. Current Orthopaedic Practice. Vol 310. Lippincott Williams & Wilkins, Philadelphia, PA.
Gaspar LR & Maia Campos PM. (2006). Evaluation of the photostability of different UV filter combinations in a sunscreen. Int J Pharm, 307, 123-8. Gerber BE, Knight M & Siebert W. (2001). Lasers in the musculoskeletal system. Springer: Berlin, Germany. Gibson SL, Cupriks DJ, Havens JJ, Nguyen ML & Hilf R. (1998). A regulatory role for porphobilinogen deaminase (PBGD) in delta-aminolaevulinic acid (delta-ALA)-induced photosensitization? Br J Cancer, 77, 235-43. Goldberg DJ. (2008). Laser dermatology : pearls and problems. Blackwell Science. : Malden, MA. Goldberg DJ, Richards RN & Mulholland S. (2000). Laser hair removal. Blackwell Science, Malden, MA. Goldman RD & Spector DL. (2005). Live cell imaging : a laboratory manual. Cold Spring Harbor Laboratory Press: Cold Spring Harbor, NY. Gollnick SO, Vaughan L & Henderson BW. (2002). 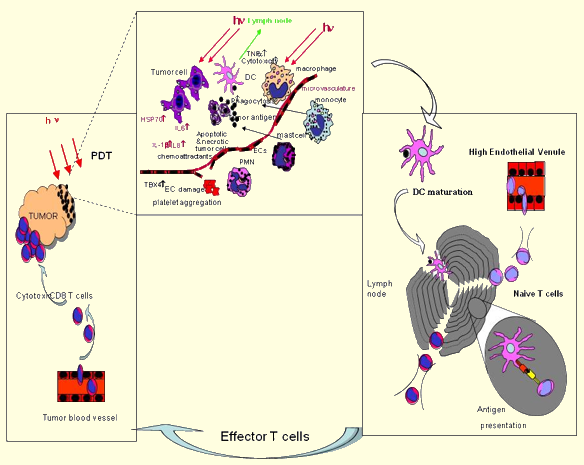 Generation of effective antitumor vaccines using photodynamic therapy. Cancer Res, 62, 1604-8. Gomer CJ, Ryter SW, Ferrario A, Rucker N, Wong S & Fisher AM. (1996). Photodynamic therapy-mediated oxidative stress can induce expression of heat shock proteins. Cancer Res, 56, 2355-60. Granville DJ, Carthy CM, Jiang H, Levy JG, McManus BM, Matroule JY, Piette J & Hunt DW. (2000). Nuclear factor-kappaB activation by the photochemotherapeutic agent verteporfin. Blood, 95, 256-262. Greinix HT, Volc-Platzer B & Knobler RM. (2000). Extracorporeal photochemotherapy in the treatment of severe graft-versus-host disease. Leuk Lymphoma, 36, 425-34. Grier DG. (2003). A revolution in optical manipulation. Nature, 424, 810-816. Gruber R, Grizenko N & Joober R. (2007). Delayed sleep phase syndrome, ADHD, and bright light therapy. J Clin Psychiatry, 68, 337-8. Hamblin MR & Hasan T. (2004). Photodynamic therapy: a new antimicrobial approach to infectious disease? Photochem. Photobiol. Sci., 3, 436-450. Hamblin MR & Mroz P. (2008). Advances in photodynamic therapy: basic, translational and clinical. Artech House: Norwood, MA. Hamblin MR, O'Donnell DA, Murthy N, Rajagopalan K, Michaud N, Sherwood ME & Hasan T. (2002). Polycationic photosensitizer conjugates: effects of chain length and Gram classification on the photodynamic inactivation of bacteria. J. Antimicrob. Chemother., 49, 941-951. Hamblin MR, Waynant RW, Anders J. (2006). Mechanisms for low-light therapy I. Proc SPIE 6140. Hendrzak-Henion JA, Knisely TL, Cincotta L, Cincotta E & Cincotta AH. (1999). Role of the immune system in mediating the antitumor effect of benzophenothiazine photodynamic therapy. Photochem. Photobiol., 69, 575-581. Holick MF & Clark MB. (1978). The photobiogenesis and metabolism of vitamin D. Fed Proc, 37, 2567-74. Hu Y, Fleming RC & Drezek RA. (2008). Optical properties of gold-silica-gold multilayer nanoshells. Opt Express, 16, 19579-91. Ichihashi M, Ueda M, Budiyanto A, Bito T, Oka M, Fukunaga M, Tsuru K & Horikawa T. (2003). UV-induced skin damage. Toxicology, 189, 21-39. Jeffreys RV. (1992). Lasers in neurosurgery. Lasers in medicine and surgery series. Wiley-Liss: New York. Jih MH & Kimyai-Asadi A. (2008). Fractional photothermolysis: a review and update. Semin Cutan Med Surg.27, 63-71. Kaiser J, Kaatz M, Elsner P & Ziemer M. (2007). Complete remission of drug-resistant Pemphigus vegetans treated by extracorporeal photopheresis. J Eur Acad Dermatol Venereol, 21, 843-4. Kaneko S. (2001). Intraoperative photodynamic diagnosis of human glioma using ALA induced protoporphyrin IX. Neurol Surg, 29, 1019-1031. Kang S, Fisher GJ & Voorhees JJ. (1997). Photoaging and topical tretinoin: therapy, pathogenesis, and prevention. Arch Dermatol, 133, 1280-4. Karu TI. (1998). The science of low-power laser therapy. Gordon and Breach: Amsterdam, Netherlands. Kereiakes DJ, Szyniszewski AM, Wahr D, Herrmann HC, Simon DI, Rogers C, Kramer P, Shear W, Yeung AC, Shunk KA, Chou TM, Popma J, Fitzgerald P, Carroll TE, Forer D & Adelman DC. (2003). Phase I drug and light dose-escalation trial of motexafin lutetium and far red light activation (phototherapy) in subjects with coronary artery disease undergoing percutaneous coronary intervention and stent deployment: procedural and long-term results. Circulation, 108, 1310-5. Kick G, Messer G, Plewig G, Kind P & Goetz AE. (1996). Strong and prolonged induction of c-jun and c-fos proto-oncogenes by photodynamic therapy. Br J Cancer, 74, 30-6. Kirlin WG, Cai J, Thompson SA, Diaz D, Kavanagh TJ & Jones DP. (1999). Glutathione redox potential in response to differentiation and enzyme inducers. Free Radic Biol Med, 27, 1208-18. Knobler RM. (1987). Photopheresis--extracorporeal irradiation of 8-MOP containing blood--a new therapeutic modality. Blut, 54, 247-50. Korbelik M & Dougherty GJ. (1999). 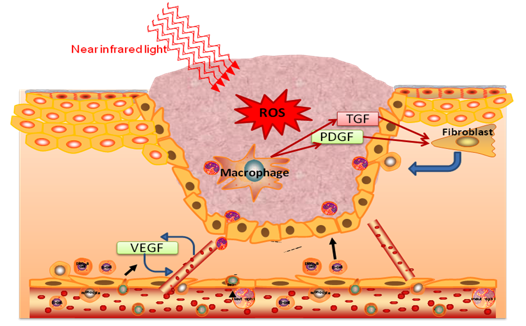 Photodynamic therapy-mediated immune response against subcutaneous mouse tumors. Cancer Res, 59, 1941-6. Korbelik M, Krosl G, Krosl J & Dougherty GJ. (1996). The role of host lymphoid populations in the response of mouse EMT6 tumor to photodynamic therapy. Cancer Res, 56, 5647-52. Korbelik M, Sun J & Cecic I. (2005). Photodynamic therapy-induced cell surface expression and release of heat shock proteins: relevance for tumor response. Cancer Res., 65, 1018-1026. Krasner N. (1991). Lasers in gastroenterology. Chapman & Hall Medical: New York, NY. Kripke DF. (1998). Light treatment for nonseasonal depression: speed, efficacy, and combined treatment. J Affect Disord, 49, 109-17. Krosl G, Korbelik M & Dougherty GJ. (1995). Induction of immune cell infiltration into murine SCCVII tumour by photofrin-based photodynamic therapy. Br J Cancer, 71, 549-55. Kubin A, Wierrani F, Burner U, Alth G & Grunberger W. (2005). Hypericin - The facts about a controversial agent. Current Pharmaceut Design, 11, 233-253. Kullavanijaya P & Lim HW. (2005). Photoprotection. J. Am Acad Dermatol, 52, 937-958. Lam RW, Goldner EM, Solyom L & Remick RA. (1994). A controlled study of light therapy for bulimia nervosa. Am J Psychiatry, 151, 744-50. Lampl Y. (2007). Laser treatment for stroke. Expert Rev Neurother, 7, 961-5. Langner A, Wolska H, Kowalski J, Duralska H & Murawska E. (1976). Photochemotherapy (PUVA) and psoriasis: comparison of 8-MOP and 8-MOP/5-MOP. Int J Dermatol, 15, 688-9. Lauro FM, Pretto P, Covolo L, Jori G & Bertoloni G. (2002). Photoinactivation of bacterial strains involved in periodontal diseases sensitized by porphycene-polylysine conjugates. Photochem. Photobiol. Sci., 1, 468-470. Lerner AB, Denton CR & Fitzpatrick TB. (1953). Clinical and experimental studies with 8-methoxypsoralen in vitiligo. J Invest Dermatol, 20, 299-314. Leunig A, Betz CS, Mehlmann M, Stepp H, Arbogast S, Grevers G & Baumgartner R. (2000). Detection of squamous cell carcinoma of the oral cavity by imaging 5-aminolevulinic acid-induced protoporphyrin IX fluorescence. Laryngoscope, 110, 78-83. Lucas C, Criens-Poublon LJ, Cockrell CT & de Haan RJ. (2002). Wound healing in cell studies and animal model experiments by low level laser therapy; Were clinical studies justified? A systematic review. Lasers Med Sci, 17, 110-134. Maisels MJ. (1990). Neonatal jaundice. Saunders: Philadelphia, PA.
Malik Z, Ladan H & Nitzan Y. (1992). Photodynamic inactivation of Gram-negative bacteria: problems and possible solutions. J Photochem Photobiol B, 14, 262-6. Melcher A, Gough M, Todryk S & Vile R. (1999). Apoptosis or necrosis for tumor immunotherapy: what's in a name? J. Mol. Med., 77, 824-833. Merchat M, Bertolini G, Giacomini P, Villanueva A & Jori G. (1996). Meso-substituted cationic porphyrins as efficient photosensitizers of gram-positive and gram-negative bacteria. J. Photochem. Photobiol. B, 32, 153-7. Minnock A, Vernon DI, Schofield J, Griffiths J, Parish JH & Brown SB. (2000). Mechanism of uptake of a cationic water-soluble pyridinium zinc phthalocyanine across the outer membrane of Escherichia coli. Antimicrob. Agents Chemother, 44, 522-527. Mitra S, Goren EM, Frelinger JG & Foster TH. (2003). Activation of heat shock protein 70 promoter with meso-tetrahydroxyphenyl chlorin photodynamic therapy reported by green fluorescent protein in vitro and in vivo. Photochem. Photobiol., 78, 615-622. Moan J & Peng Q. (2003). An outline of the hundred-year history of PDT. Anticancer Res, 23, 3591-3600. Moges H, Vasconcelos OM, Campbell WW, Borke RC, McCoy JA, Kaczmarczyk L, Feng J & Anders JJ. (2009). Light therapy and supplementary Riboflavin in the SOD1 transgenic mouse model of familial amyotrophic lateral sclerosis (FALS). Lasers Surg Med, 41, 52-9. Monem El Mofty A. (1948). A preliminary clinical report on the treatment of leucodermia with Ammi majus Linn. J Egypt Med Assoc, 31, 651-65. Moreno PR & Fuster V. (2004a). The year in atherothrombosis. J Am Coll Cardiol, 44, 2099-110. Moreno PR, Purushothaman KR, Fuster V, Echeverri D, Truszczynska H, Sharma SK, Badimon JJ & O'Connor WN. (2004b). Plaque neovascularization is increased in ruptured atherosclerotic lesions of human aorta: implications for plaque vulnerability. Circulation, 110, 2032-8. Muller JE, Abela GS, Nesto RW & Tofler GH. (1994). Triggers, acute risk factors and vulnerable plaques: the lexicon of a new frontier. J Am Coll Cardiol, 23, 809-13. Naghavi M, Libby P, Falk E, Casscells SW, Litovsky S, Rumberger J, Badimon JJ, Stefanadis C, Moreno P, Pasterkamp G, Fayad Z, Stone PH, Waxman S, Raggi P, Madjid M, Zarrabi A, Burke A, Yuan C, Fitzgerald PJ, Siscovick DS, de Korte CL, Aikawa M, Airaksinen KE, Assmann G, Becker CR, Chesebro JH, Farb A, Galis ZS, Jackson C, Jang IK, Koenig W, Lodder RA, March K, Demirovic J, Navab M, Priori SG, Rekhter MD, Bahr R, Grundy SM, Mehran R, Colombo A, Boerwinkle E, Ballantyne C, Insull W, Jr., Schwartz RS, Vogel R, Serruys PW, Hansson GK, Faxon DP, Kaul S, Drexler H, Greenland P, Muller JE, Virmani R, Ridker PM, Zipes DP, Shah PK & Willerson JT. (2003). From vulnerable plaque to vulnerable patient: a call for new definitions and risk assessment strategies: Part II. Circulation, 108, 1772-8. Nitzan Y, Gutterman M, Malik Z & Ehrenberg B. (1992). Inactivation of gram-negative bacteria by photosensitized porphyrins. Photochem. Photobiol., 55, 89-96. O'Donovan C, Hynes J, Yashunski D & Papkovsky DB. (2005). Phosphorescent oxygen-sensitive materials for biological applications. J Material Chem, 15, 2946-2951. Ortel B, Chen N, Brissette J, Dotto GP, Maytin E & Hasan T. (1998). Differentiation-specific increase in ALA-induced protoporphyrin IX accumulation in primary mouse keratinocytes. Br J Cancer, 77, 1744-51. Parrish JA, Fitzpatrick TB, Tanenbaum L & Pathak MA. (1974). Photochemotherapy of psoriasis with oral methoxsalen and longwave ultraviolet light. N Engl J Med, 291, 1207-11. Parry BL, Berga SL, Mostofi N, Sependa PA, Kripke DF & Gillin JC. (1989). Morning versus evening bright light treatment of late luteal phase dysphoric disorder. Am J Psychiatry, 146, 1215-7. Pastore D, Greco M, Petragallo VA & Passarella S. (1994). Increase in H+/e- ratio of the cytochrome c oxidase reaction in mitochondria irradiated with helium-neon laser. Biochem Mol Biol Int, 34, 817-26. Peng Q, Warloe T, Berg K, Moan J, Kongshaug M, Giercksky KE & Nesland JM. (1997). 5-Aminolevulinic acid-based photodynamic therapy. Clinical research and future challenges. Cancer, 79, 2282-308. Perelman LT. (2006). Optical diagnostic technology based on light scattering spectroscopy for early cancer detection. Expert Rev Med Devices, 3, 787-803. Radenhausen M, Michelsen S, Plewig G, Bechara FG, Altmeyer P & Hoffmann K. (2004). Bicentre experience in the treatment of severe generalised atopic dermatitis with extracorporeal photochemotherapy. J Dermatol, 31, 961-70. Rockson SG, Kramer P, Razavi M, Szuba A, Filardo S, Fitzgerald P, Cooke JP, Yousuf S, DeVault AR, Renschler MF & Adelman DC. (2000). Photoangioplasty for human peripheral atherosclerosis: results of a phase I trial of photodynamic therapy with motexafin lutetium (Antrin). Circulation, 102, 2322-4. Rovaldi CR, Pievsky A, Sole NA, Friden PM, Rothstein DM & Spacciapoli P. (2000). Photoactive porphyrin derivative with broad-spectrum activity against oral pathogens in vitro. Antimicrob. Agents Chemother., 44, 3364-3367. Sack RL, Auckley D, Auger RR, Carskadon MA, Wright KP, Jr., Vitiello MV & Zhdanova IV. (2007). Circadian rhythm sleep disorders: part I, basic principles, shift work and jet lag disorders. An American Academy of Sleep Medicine review. Sleep, 30, 1460-83. Scharffetter-Kochanek K, Wlaschek M, Brenneisen P, Schauen M, Blaudschun R & Wenk J. (1997). UV-induced reactive oxygen species in photocarcinogenesis and photoaging. Biol Chem, 378, 1247-57. Scheuer E & Warshaw E. (2006). Sunscreen allergy: A review of epidemiology, clinical characteristics, and responsible allergens. Dermatitis, 17, 3-11. Schmidt-Erfurth U & Hasan T. (2000). Mechanisms of action of photodynamic therapy with verteporfin for the treatment of age-related macular degeneration. Surv Ophthalmol, 45, 195-214. Schmitz-Valckenberg S, Holz FG, Bird AC & Spaide RF. (2008). Fundus autofluorescence imaging: review and perspectives. Retina, 28, 385-409. Selkin B, Rajadhyaksha M, Gonzalez S & Langley RG. (2001). In vivo confocal microscopy in dermatology. Dermatol Clin, 19, 369-77. Smith E & Dent G. (2005). Modern Raman spectroscopy : a practical approach. J. Wiley: Hoboken, NJ. Soukos NS, Ximenez-Fyvie LA, Hamblin MR, Socransky SS & Hasan T. (1998). Targeted antimicrobial photochemotherapy. Antimicrob. Agents Chemother., 42, 2595-2601. Stary HC, Chandler AB, Dinsmore RE, Fuster V, Glagov S, Insull W, Jr., Rosenfeld ME, Schwartz CJ, Wagner WD & Wissler RW. (1995a). A definition of advanced types of atherosclerotic lesions and a histological classification of atherosclerosis. A report from the Committee on Vascular Lesions of the Council on Arteriosclerosis, American Heart Association. Circulation, 92, 1355-74. Stary HC, Chandler AB, Dinsmore RE, Fuster V, Glagov S, Insull W, Jr., Rosenfeld ME, Schwartz CJ, Wagner WD & Wissler RW. (1995b). A definition of advanced types of atherosclerotic lesions and a histological classification of atherosclerosis. A report from the Committee on Vascular Lesions of the Council on Arteriosclerosis, American Heart Association. Arterioscler Thromb Vasc Biol, 15, 1512-31. Stern RS, Laird N, Melski J, Parrish JA, Fitzpatrick TB & Bleich HL. (1984). Cutaneous squamous-cell carcinoma in patients treated with PUVA. N Engl J Med, 310, 1156-61. Strong J. (2002). Pain : a textbook for therapists. Churchill Livingstone: New York, NY. Sun J, Cecic I, Parkins CS & Korbelik M. (2002). Neutrophils as inflammatory and immune effectors in photodynamic therapy-treated mouse SCCVII tumours. Photochem. Photobiol. Sci., 1, 690-695. Svanberg K, Liu DL, Wang I, Andersson-Engels S, Stenram U & Svanberg S. (1996). Photodynamic therapy using intravenous delta-aminolaevulinic acid-induced protoporphyrin IX sensitisation in experimental hepatic tumours in rats. Br J Cancer, 74, 1526-33. Szeimies RM, Sassy T & Landthaler M. (1994). Penetration potency of topical applied delta-aminolevulinic acid for photodynamic therapy of basal cell carcinoma. Photochem Photobiol, 59, 73-6. Terman JS, Terman M, Schlager D, Rafferty B, Rosofsky M, Link MJ, Gallin PF & Quitkin FM. (1990). Efficacy of brief, intense light exposure for treatment of winter depression. Psychopharmacol Bull, 26, 3-11. Topol EJ. (2003). Textbook of interventional cardiology. W.B. Saunders Co.: Philadelphia, PA. Trimmer PA, Schwartz KM, Borland MK, De Taboada L, Streeter J & Oron U. (2009). Reduced axonal transport in Parkinson's disease cybrid neurites is restored by light therapy. In Press. Mol Neurodegener. Trivedi NS, Ghouri AF, Shah NK, Lai E & Barker SJ. (1997). Effects of motion, ambient light, and hypoperfusion on pulse oximeter function. J Clin Anesth, 9, 179-83. Tuner J & Hode L. (2004). Laser therapy handbook : a guide for research scientists, doctors, dentists, veterinarians and other interested parties within the medical field. Prima Books: Grangesberg, Sweden. Turrens JF. (2003). Mitochondrial formation of reactive oxygen species. J Physiol, 552, 335-44. Tuunainen A, Kripke DF & Endo T. (2004). Light therapy for non-seasonal depression. Cochrane Database Syst Rev, CD004050. van de Ven S, Elias S, Wiethoff A, van der Voort M, Leproux A, Nielsen T, Brendel B, Bakker L, van der Mark M, Mali W & Luijten P. (2009). Diffuse optical tomography of the breast: initial validation in benign cysts. Mol Imaging Biol, 11, 64-70.
van den Bergh H & Ballini JP. (2002a). Photodynamic Therapy for Age Related Macular Degeneration: Fundamentals, the Present Situation, and Future Developments. In Photodynamic Therapy of Ocular Diseases, Gragoudas, E.S., Miller, J. & Zographos, L. (eds),. pp. 1-27. Lippincott, Williams and Wilkins, Philadelphia, PA.
van den Bergh H & Ballini JP. (2002b). Photodynamic Therapy: Basic Principles and Mechanisms. In Lasers in Ophthalmology - Surgical and Diagnostic Aspects, Fankhauser, F. & Kwasniewska, S. (eds), 1-23. Kugler: The Hague, Netherlands. van den Boogert J, van Hillegersberg R, de Rooij FW, de Bruin RW, Edixhoven-Bosdijk A, Houtsmuller AB, Siersema PD, Wilson JH & Tilanus HW. (1998). 5-Aminolaevulinic acid-induced protoporphyrin IX accumulation in tissues: pharmacokinetics after oral or intravenous administration. J Photochem Photobiol B, 44, 29-38. Van Hillegersberg R, Van den Berg JW, Kort WJ, Terpstra OT & Wilson JH. (1992). Selective accumulation of endogenously produced porphyrins in a liver metastasis model in rats. Gastroenterology, 103, 647-51. Voll RE, Herrmann M, Roth EA, Stach C, Kalden JR & Girkontaite I. (1997). Immunosuppressive effects of apoptotic cells. Nature, 390, 350-1. Vreman HJ, Wong RJ & Stevenson DK. (2004). Phototherapy: Current methods and future directions. Seminars in Perinatology, 28, 326-333. Wainwright M, Phoenix DA, Laycock SL, Wareing DR & Wright PA. (1998). Photobactericidal activity of phenothiazinium dyes against methicillin-resistant strains of Staphylococcus aureus. FEMS Microbiol. Lett., 160, 177-181. Wang LV (2009). Photoacoustic imaging and spectroscopy. CRC Press, Boca Raton FL. Wieland M, Thiede VL, Strauss RG, Piette WW, Kapelanski DP, Landas SK, Hunsicker LG, Vance SJ & Randels MJ. (1994). Treatment of severe cardiac allograft rejection with extracorporeal photochemotherapy. J Clin Apher, 9, 171-5. Wilson M & Yianni C. (1995). Killing of methicillin-resistant Staphylococcus aureus by low-power laser light. J .Med. Microbiol., 42, 62-66. Wirz-Justice A, Graw P, Krauchi K, Gisin B, Jochum A, Arendt J, Fisch HU, Buddeberg C & Poldinger W. (1993). Light therapy in seasonal affective disorder is independent of time of day or circadian phase. Arch Gen Psychiatry, 50, 929-37. Witjes JA & Douglass J. (2007). The role of hexaminolevulinate fluorescence cystoscopy in bladder cancer. Nat Clin Pract Urol, 4, 542-9. Wormald R, Evans J, Smeeth L & Henshaw K. (2007). Photodynamic therapy for neovascular age-related macular degeneration. Cochrane Database Syst Rev, CD002030. Wright VC & Fisher JC. (1993). Laser surgery in gynecology : a clinical guide. Saunders: Philadelphia. Yamada N, Martin-Iverson MT, Daimon K, Tsujimoto T & Takahashi S. (1995). Clinical and chronobiological effects of light therapy on nonseasonal affective disorders. Biol Psychiatry, 37, 866-73. Yang M, Nazhat NB, Jiang X, Kelsey SM, Blake DR, Newland AC & Morris CJ. (1996). Adriamycin stimulates proliferation of human lymphoblastic leukaemic cells via a mechanism of hydrogen peroxide (H2O2) production. Br J Haematol, 95, 339-44.